In full disclosure, my husband did not need to be “sold” on the idea of a budget. We’re both number nerds and we both got disgusted with debt. However, we have led and participated in classes with other couples where clearly one was all in and the other looked like a deer in headlights. This just as easily applies if she’s the spender and he’s the saver or vice versa. 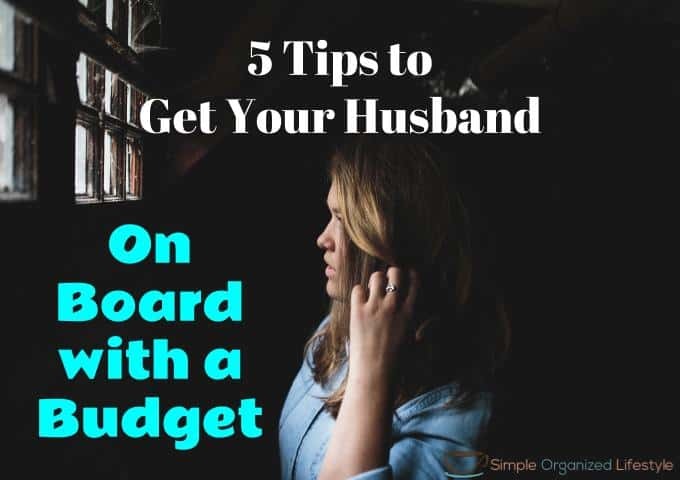 Based on experience and observations with other couples, these are 5 tips for getting a reluctant husband getting on board with a budget. 1. Show him the money! Budget is a bad word. It just is. It brings up those feelings of dread, doom and limitation. Not fun and freedom. But numbers are facts. Facts are easier to sell than “we have to create a budget!” Don’t call it a budget. Call it a spending plan, a get out of debt plan or a freedom fund! Tell your significant other you have been working with your numbers and have found a way to spend your money and have some left too. That’s much more appealing than the thought of a burden budget. My favorite classes we’ve attended have been small, intimate, couples’ classes. We’ve attended most of these through our church. Finances ALWAYS become part of the conversation at some point. It’s hard for everyone. It’s normal. It’s messy. I remember a couple arguing once because he said he was not at his job all day earning money for her to be at Walmart during the day spending it. She said while he was at his job all day she needed to get out with their two small kids and make sure they had diapers. They both had valid points! Some of the couples in the class started giving them some gentle advice and it was all refreshing because, again, it’s normal and it’s messy! There’s no denying that visuals are powerful. Anyone heard of a site called Pinterest? There’s a reason people (okay, me) get on that site and can’t get off! How does this relate to a budget? A budget makes it possible to do or buy things… exactly opposite of what comes to mind when we think about a budget. Granted, you may have to start small and your visual may be a picture of a vacation spot, a new appliance or a home improvement you need. Whatever it is, present your spouse with a visual of what you can achieve when you create a spending plan, a get out of debt plan or a freedom fund! One mistake I see is couples starting from scratch with a budget without knowing what their real spending habits are. This can lead to feeling defeated pretty quickly. For example, let’s say you set a budget of $500 a month for groceries. You get to the end of the month and actually spent $900 and feel like it’s just not possible. Before you can create a budget, you have to know your current spending habits. For a couple of months, keep a list of everything you spend. Make this super simple for the spouse who is more anti-budget. A suggestion is to both have logins to an app (we like Every Dollar), have one place (like a basket on the counter) where you collect all receipts, or (this is what we do) one spouse texts the other when they spend any money. Simply put a legal pad in one location. Whatever you do to start this process, make it as simple as possible. Taking all “fun” out of the budget does not make it something that we are eager to sign up for. Budget for fun money and make sure you both know that amount is free for however you choose to spend it. Maybe your husband has a hobby and he feels that a budget means the end of that hobby. Make sure he knows that’s not the case. He can still buy golf equipment, fishing lures or (in our home) bicycle parts, but you just have to put numbers on those things so you can adjust over time as you build a budget that helps you save AND live. If you have tried all of these things (and more) and still have a spouse that’s not on board with the budget, don’t lose hope. Sometimes it just takes awhile when you’re talking about change, new habits, and thinking about money differently. What about you? If you and your spouse are on board with a budget, was it always that way or did it take some time to get on the same page? Amazing how just calling it that can help us feel more positive! Thanks for commenting!